When the sun goes down, day is done for many creatures. But for others, nighttime is the right time to be awake. While you sleep the night away, there’s another world outside that’s wide awake. It’s made up of nocturnal (nok-TUR-nul) animals–ones that are active at night. 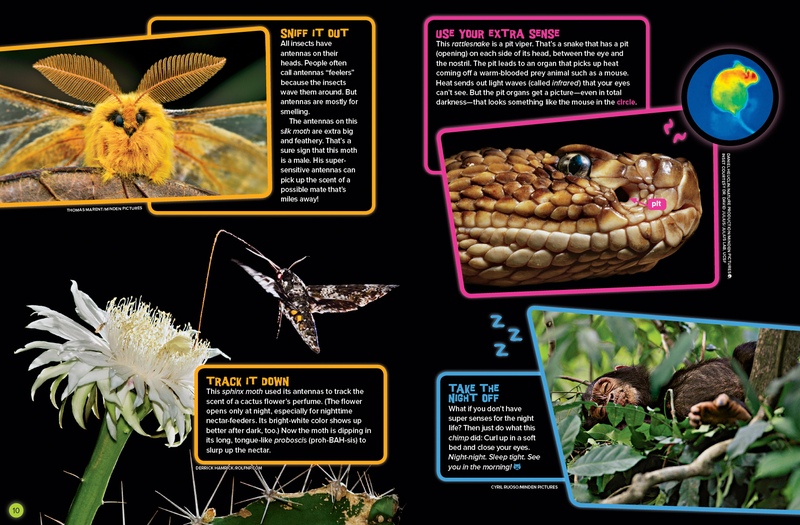 How do nocturnal creatures manage in the dark? They put all their senses to good use. Check it out! In order for eyes to see, they need light–even if it’s just a glimmer of moonlight or starlight. And the bigger the eyes are, the wider the pupils can open to let in as much dim light as possible. No animal has bigger eyes (compared to its body size) than a tarsier (TAR-see-ur)–the tiny, nocturnal monkey-relative you see here. When looking for a mate, a firefly (also called lightning bug) uses bioluminescence (bye-oh-loo-muh-NES-ens) to flash signals to other fireflies. (Bio means “living,” and luminescence means “light.”) These flashes of light show up well in the dark, helping males and females find each other at night. Like the tarsier, this barn owl has big eyes for night vision. But it also has fantastic hearing. See how the feathers on the owl’s face form a disc? The disc collects sounds (kind of like a satellite dish) and directs them to the ears. The owl can raise or lower the stiff, dark feathers around the edge and down the middle of its face. That changes the shape of the disc to channel the sounds to each ear even better. The owl’s ear openings are hidden under the face feathers. Otherwise, you could see that one is lower than the other. All of this helps the bird tell whether a sound is coming from the left or the right, from above or below. Most cats (including this house cat) are nocturnal. And their trademark whiskers are purrfect for the night life. Whiskers are like long, thick, stiff hairs, and they’re very sensitive. They help a cat feel its way around and through tight spaces. They also help it feel changes in the air, maybe caused by a prey animal–or an enemy–that moves nearby. “Blind as a bat” isn’t a very good saying, since bats can see. But they can hear way better, which comes in handy for hunting at night. This little brown bat is using echolocation (eh-koh-loh-KAY-shun) to help it capture that juicy moth. 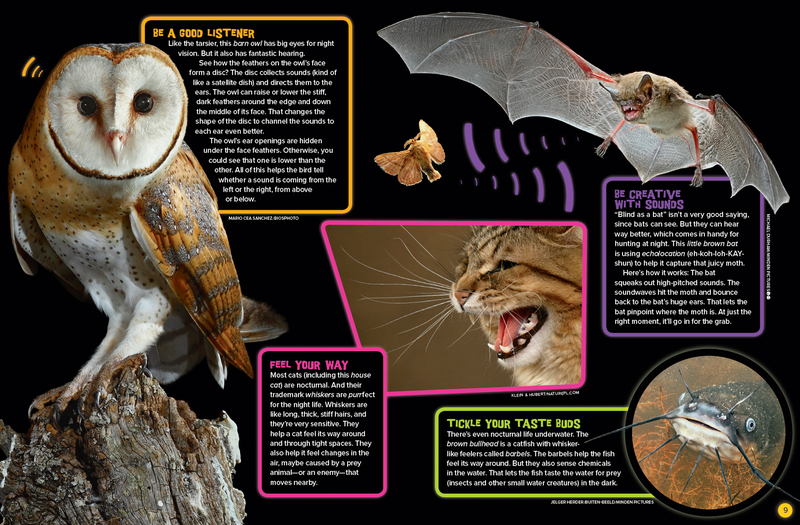 Here’s how it works: The bat squeaks out high-pitched sounds. The soundwaves hit the moth and bounce back to the bat’s huge ears. That lets the bat pinpoint where the moth is. At just the right moment, it’ll go in for the grab. There’s even nocturnal life underwater. The brown bullhead is a catfish with whisker-like feelers called barbels. The barbels help the fish feel its way around. But they also sense chemicals in the water. That lets the fish taste the water for prey (insects and other small water creatures) in the dark. All insects have antennas on their heads. People often call antennas “feelers” because the insects wave them around. But antennas are mostly for smelling. The antennas on this silk moth are extra big and feathery. That’s a sure sign that this moth is a male. His super-sensitive antennas can pick up the scent of a possible mate that’s miles away! This sphinx moth used its antennas to track the scent of a cactus flower’s perfume. (The flower opens only at night, especially for nighttime nectar-feeders. Its bright-white color shows up better after dark, too.) Now the moth is dipping in its long, tongue-like proboscis (proh-BAH-sis) to slurp up the nectar. This rattlesnake is a pit viper. That’s a snake that has a pit (opening) on each side of its head, between the eye and the nostril. The pit leads to an organ that picks up heat coming off a warm-blooded prey animal such as a mouse. Heat sends out light waves (called infrared) that your eyes can’t see. But the pit organs get a picture–even in total darkness–that looks something like the mouse in the circle. What if you don’t have super senses for the night life? Then just do what this chimp did: Curl up in a soft bed and close your eyes. Night-night. Sleep tight. See you in the morning! 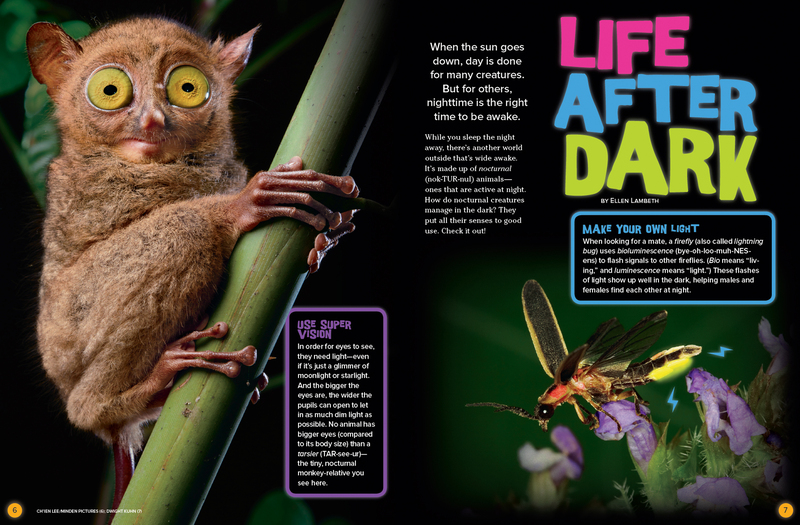 “Life After Dark” originally appeared in the October 2016 issue of Ranger Rick magazine.